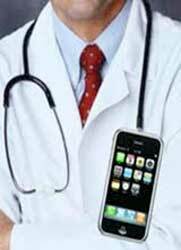 But attach a special case and that same phone can produce an electrocardiogram (ECG) from the electrical impulses in your hand and send it to a doctor. "It's a neat little device," says E.B. Fox, who uses a heart monitor and app from AliveCor to keep track of his arrhythmia. The 57-year-old North Carolina resident says he has been using the device since October. If he thinks there is a problem, he can email a reading to his doctor for an evaluation. "I have no doubt it's saved me one doctor's visit at least," said Fox. The heart monitor is just one example of progress in the booming mobile health - or mHealth - sector, which is changing both the way doctors practice medicine, and the way patients handle medical decisions. "Mobile apps are one of many mHealth tools that are helping to engage consumers and patients in their own health care," David Collins, senior director of the mobile division at the non-profit Healthcare Information and Management Systems Society, told AFP. 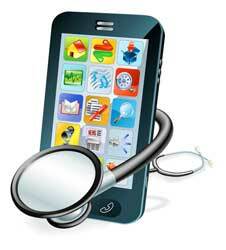 Doctors and developers alike are hoping that these mobile apps and devices will lead to lower health care costs. Health care businesses such as hospitals and insurance companies traditionally focus on quantity, counting the number of patients seen and procedures done. But as the system shifts and firms try try to quantify the quality of care, factors such as whether a patient returns to the hospital within 30 days of treatment come into play, and can affect insurance payouts. The idea is that if patients track their own health, using mobile apps and other tools, the extra data can reduce the numbers of doctor's visits, and make each one more effective. The Scripps Translational Science Institute in California is in the middle of a study examining the relationship between medical costs and mobile medical devices, specifically in patients with chronic conditions. Participants receive an iPhone and either a blood pressure monitor, heart monitor, or glucose meter to track their high blood pressure, arrhythmia, or diabetes for six months. Lead researcher Cinnamon Bloss said the team will be looking to see if by monitoring their own symptoms, patients can avoid unnecessary trips to the doctor or emergency room, as Fox has. A few months into the study, Bloss has already noticed one longstanding problem that persists despite the ease of using mobile apps - patient compliance. "We're offering a free phone and device for a disease they already have, but many people don't want to be bothered, don't want to take the time," Bloss said. And according to Iltifat Husain, the founder of the app review website iMedicalApps.com, a lack of adherence to treatment plans can have significant financial and health-related consequences. "Patients who are non-compliant end up costing us billions of dollars in the health care system. I see it on a daily basis," he said at an event at the Brookings Institution in Washington. "I'll see it in patients who come in in essentially a diabetic coma because they weren't taking their medications appropriately." As smartphones are increasingly a part of everyday life, even for older Americans, Husain says mobile health tools are improving. 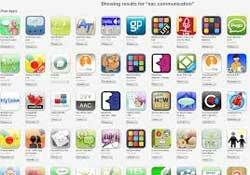 "The quality of medical apps has grown tremendously in the last year or two, because people have a higher medical app literacy," he told AFP. That's also as a result of the guidelines released by the US Food and Drug Administration in September last year, which Husain said were helping to ward off the release of dodgy apps that could put patients at risk. "Initially you had the Wild West - now you have a sheriff who's come to town," Husain said. But in a rapidly growing field that allows massive amounts of data to be collected, Husain offered a few words of caution. "Just because we can monitor vital signs and other things doesn't necessarily mean we should. It doesn't necessarily mean that it leads to a better outcome," he warned. "As a society, we need to figure out if we're willing to change the fundamental physician-patient relationship," he added.